We also distribute coupons through doormail and in Columbia Marketplace. Be sure you check your mail today; your coupons are waiting for you. With coupon. Coupon must be presented when items are dropped off. Not valid with other offers. 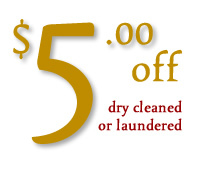 $1.00 off each dry cleaned item! 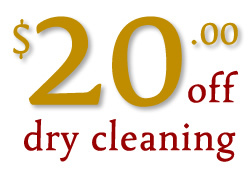 Limit 20 discounted items. With coupon. Coupon must be presented when items are dropped off. Not valid with other offeres.